Too many late-night shows rely on dunking on people, something that Minhaj managed to avoid in the first two episodes of his Netflix show Patriot Act. "I never really thought about Dunk Fatigue until I saw Hasan Minhaj ... masterfully working around it," says Linda Holmes. "What is Dunk Fatigue? Well, let us take as a baseline that public life currently is full of people who are pretty easy to dunk on. And let us define 'dunk' as a satisfying joke or barrage of jokes mixed with truths, cathartic and merciless, ostentatious and totally sincere, done in front of an audience eager to cheer. Any time you see a headline that says '(SO-AND-SO) DESTROYS (SUCH-AND-SUCH) OVER (TOPIC),' where said destruction takes place in a video you can watch that's just someone talking, that's probably a good old dunk." 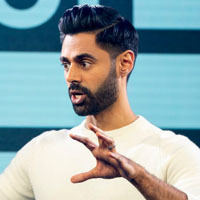 Holmes adds: "Minhaj's Patriot Act has, on the one hand, a host who is as good a dunker as anyone you will ever see...If Minhaj, himself a Daily Show graduate, just wanted to dunk on people for a half-hour at a time, he could do it. It would probably keep people who like him happy for a while. But he doesn't. The show finds him not behind a desk but standing in front of a crowd, just like in stand-up. The show looks filmed rather than videotaped, and Minhaj simply addresses the crowd — yes, a little like a funny Ted Talk — and then the show is over. It could be nothing but great dunks. It just isn't."